Christmas is over and we are into the New Year! Let's share of cup of Tazo "Joy" tea, that I received from a sweet neighbor, shall we? I've made some yummy bars to eat and I'll show you some pictures of what we've been up to. This iron angel is the smallest of a trio set that I bought years ago, which adorn my mantle at Christmas time. You can have your tea from this favorite Johnson Brothers Friendly Village, the Ice House. Isn't this the perfect pattern for winter time? 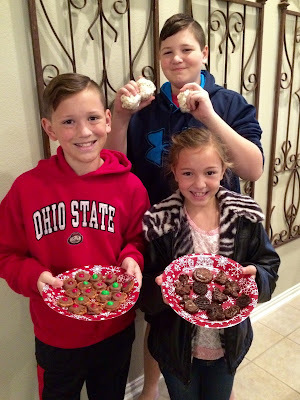 These three sweet grands had a sleepover at my house and we made Rolo and Dove Caramel pretzel treats (the Rolos won the challenge! ), brownie cut outs, and popcorn balls. Oh, it was such fun! 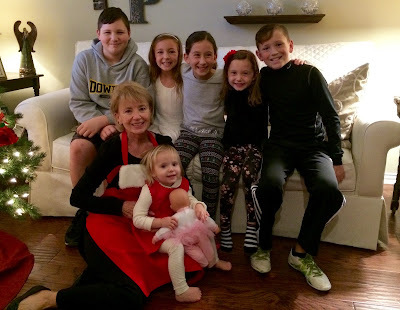 I celebrated Christmas Eve with some of my family and six of my grandchildren. The kids changed into their jammies that I gave them and we decorated soft frosted sugar cookies, which was a great suggestion from my daughter-in-law. The kids had cookies for Santa! Yes, it made a mess, but just look at those happy faces! We even decorated a cookie for baby Jesus and talked about why we celebrate Christmas. Two-year-old Harper was chosen to blow out the candle, while we sang Happy Birthday. My son, Mike, worked hours, upon hours creating characters for each of his nieces and nephews. He gave them all "Uncle Bucks" when they came, and they had to go into my sewing room (where he keeps Uncle Buck toys/gifts) and they were to choose something. They were excited to find their own little avatar. When I awoke on Christmas morning, lo and behold, I had my own avatar surprise waiting for me!! Happy New Year Blessings to each of you! 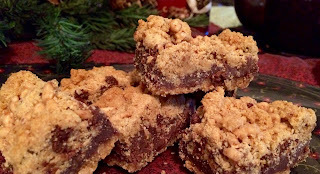 These are a fudgy toffee treat that are great for feeding a crowd. They also freeze well after baking. Heat oven to 350 degrees (325 for dark or iconoclastic pan). Spray bottom only of 13 x 9-inch pan with cooking spray. In medium bowl, stir 1/2 cup melted butter, 1 and 1/2 cups of the graham cracker crumbs and 3/4 cup of the toffee bits. Press mixture evenly in bottom of pan. Refrigerate about 15 minutes or until grim. Meanwhile, let cookie dough stand at room temperature for 10 minutes to soften. In a 2-quart saucepan, heat chocolate chips, sweetened condensed milk and 1 tablespoon butter over medium heat, stirring frequently, until chips are melted and mixture is smooth. Remove from heat; stir in vanilla. Spread mixture over cracker crust. In medium bowl, break up cookie dough. Mix in remaining 1/2 cup cracker crumbs with wooden spoon until well blended/ Crumble mixture evenly over chocolate layer. Sprinkle with remaining 3/4 cup toffee bits. Bake 25-35 minutes or until golden brown. Cool completely, about 2 hours. Cut into 8 rows by 4 rows. Wow! I am blown away by the sweet avatar your son created. He is very talented and he captured your essence for sure! Sweet photo of you with the grandchildren. You helped make this Christmas very Narnia magical for them... Oh those bars look amazing. Maybe I can try some in a few months. Ha! Mike is quite an artist! What fun for the children! Hope 2017 is a good year for you and your family, Kitty. I always enjoy seeing the smiling faces of your sweet grandkids. Mike's avatars are fabulous! Last month, I was thrilled to score a set of 4 Friendly Village tea sets at a local thrift store which I gave to my mom (she has the matching mugs). I was tempted to get the Tazo Joy tea at the store, but I'm currently on a "tea diet" so I left it behind. 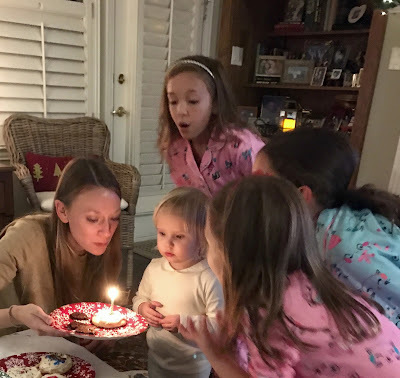 Dear Kitty, what a wonderful new year with your sweet grands and all the fun you make at your home. Love your pics!! 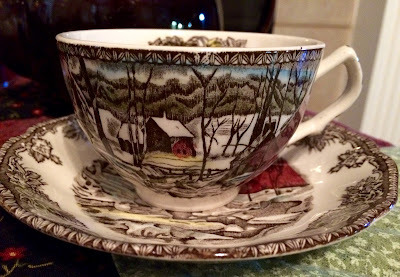 The teacup is a favorite and I found two before Christmas to make a little set. I was thrilled. Your recipe sounds delicious. Your sons avatar gifts are very special!! What a talent he is and such a dear to his nieces and nephews. 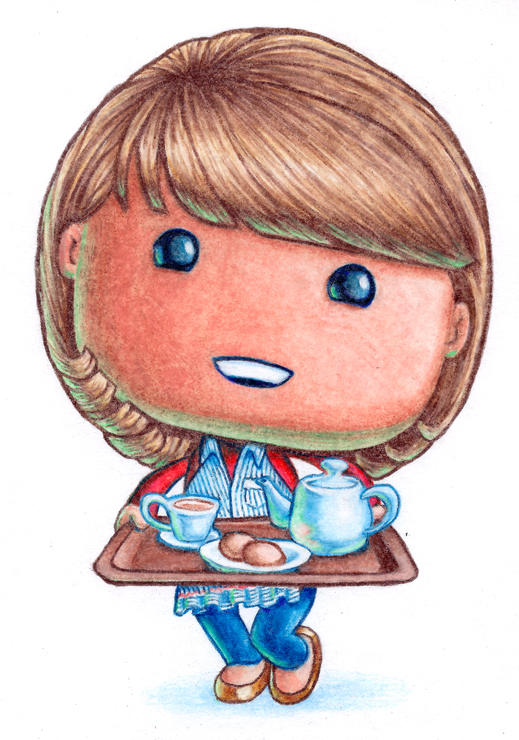 Then to bless you with one for your blog is adorable. I love it!! Wishing you a very Happy New Year filled with many blessings!! . Looks like you and the grands had so much fun! And Mike is a very talented artist. Dear Kitty, Happy New Year! It looks like good times at your house with the grands. 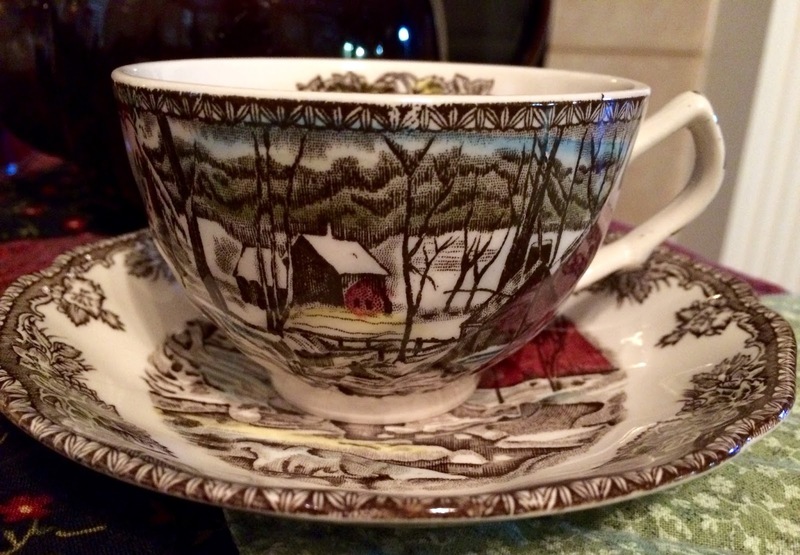 I love that tea cup and saucer for wintertime. Mike is so talented! I love that he's so involved with the kids. Love the avatar he made of you. So cute! Happy New Year to you. It looks like your holiday was great. The grandkids are so cute. I love, love love that you had them sing to Jesus. Warms my heart. All your photos are beautiful, dear Kitty. Your son did an amazing job on those avatar gifts!! He is quite talented, and I just love your profile picture now. I have a brown tea pot just like yours. 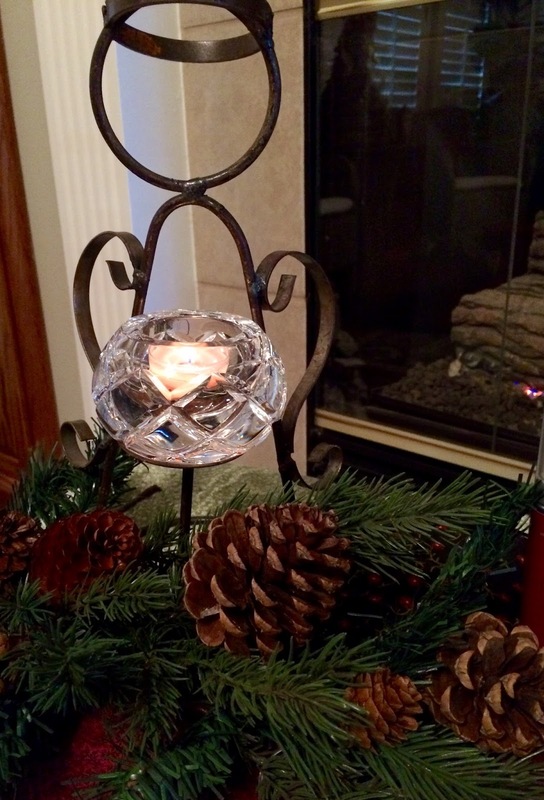 A dear friend gifted it to me years ago and it was her dear mothers who passed away many years ago. I was honored that she would give me such a treasure of the family's. Your chocolate treats look quite yummy. Oh wow! Those kiddos faces tell it all! I love the Avatar profile picture, it it so cute! Then to top everything off, the chocolate chip toffee bars looks so good. Have a most wonderful 2017! Looking forward to what it holds. Happy New Year! Such lovely photos of your home and family! What a talented guy your son Mike is, your avatar is just like you. Such a treat for the kids to have one too and I know how much they like baking with Grandma. I hardly made anything this year, a couple of tea loaves just so I wouldn't have to eat a lot of sweets. Oh Kitty, your son Mike is something else! I love the avatar of you with your tea tray. Happy New Year dear friend! It looks like a wonderful time. Kitty, while your recipes are always enticing, and yes, JB Friendly Village is perfect for winter, what could possibly top the fact that you had those 6 beautiful faces - all smiles - obviously enjoying their time with their Grandma?! That truly is priceless. I noticed your avatar right away in a comment on someone else's blog, and it's perfect. I love it! Happy New Year, friend! It looks like you & the grands (& Mike, too!) were having a blast on their school break! Lots of fun memories made for all. Your pretty cup must enhance the Tazo "Joy" tea...a new flavor for me...I must find some to try soon. Thank you for the yummy looking recipe. Filing it away for future events. Thank you for sharing such a heartwarming post, sweet Kitty. How I love reading about your Christmas festivites and seeing your lovely family pictures. And I just LOVE the picture your son drew of you. It's represents you perfectly :) Love to you, my friend. Hi Kitty and Happy New Year! It looks as though your holiday was perfect and filled with loved ones. Nothing better than that. Your new avatar is delightful too. PS: I think Friendly Village is the perfect winter design. Works Thanksgiving though Christmas and into January too. So cozy! Love the picture of you with all the grands. 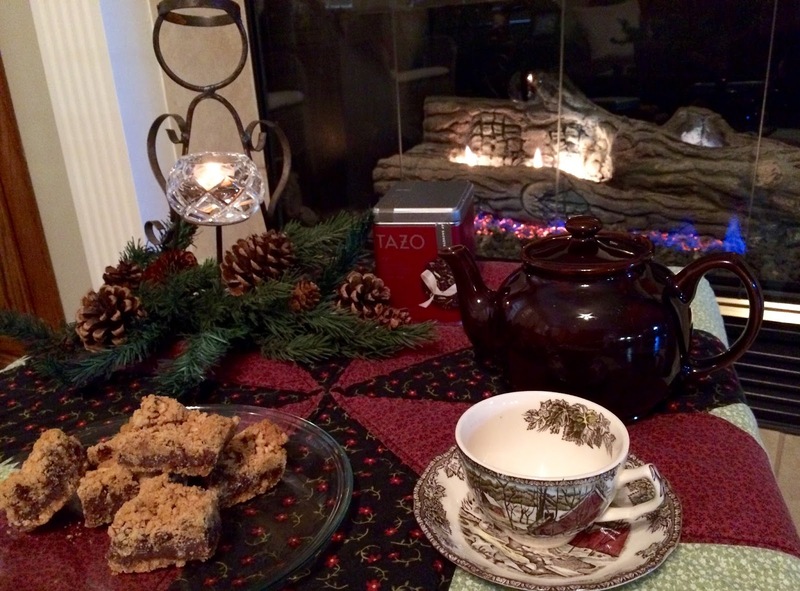 Chocolate toffee bars sound really good right now.Love your sweet Christmas traditions and the avators are amazing. I've had a nice visit in Dallas with my grands. I'm just beaming with happiness. And ♥ the pic of you with 6 of your grandchildren - they are beautiful and so well loved. Hugs. 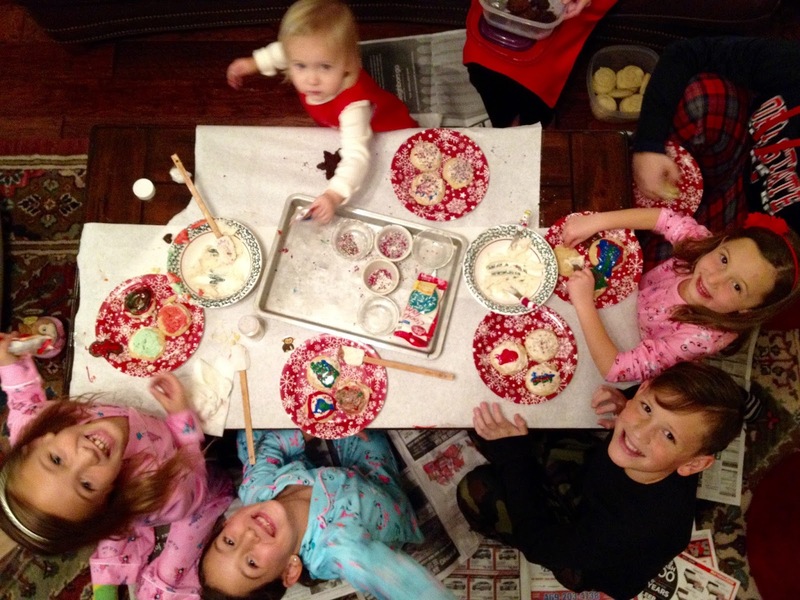 The photos here are so great, Kitty...when we first started making cookies and such, our grands were little like yours...just look at them now...you have more fun years ahead with your growing grands. love to you. I would love you to share this at Smell Good Sunday! Hi Kitty and Happy New Year! I enjoyed looking at photos of you and your family! This looks so good and I bet they are delicious. I hope you enjoy the rest of the week and weekend. Such a joy-filled Christmas! I have the same pattern of Johnson's Brothers. It was my mom's and I inherited it when she passed away 16 years ago. I'm going to try your recipe as I love chocolate and toffee. :) Snow is coming our way this weekend and it seems a perfect treat to make ahead of the storm. Have a blessed weekend!!! Kitty, your son Mike is so talented. I love the little avatars he made for each of you! Always love Johnson Bros. and your toffee bars sound so yummy. Glad you had a wonderful Christmas with some of your family! Thanks for sharing with SYC. What a lovely and special Christmas you had with your family…that's wonderful. Wishing you all the best in this New Year. You are so blessed to have a batch of grandkids and they look so sweet there with you. What a blessing! The cookies you helped them bake all look amazing. What sweet kiddos. You are so lucky to have them. You are the very Nana. Love the fudgy chocolate chip toffee bars. I have some of those Johnson Brothers dishes. I need to get them out and use them. Here's to a bright new year Kitty. I LOVE your new avatar! How sweet! 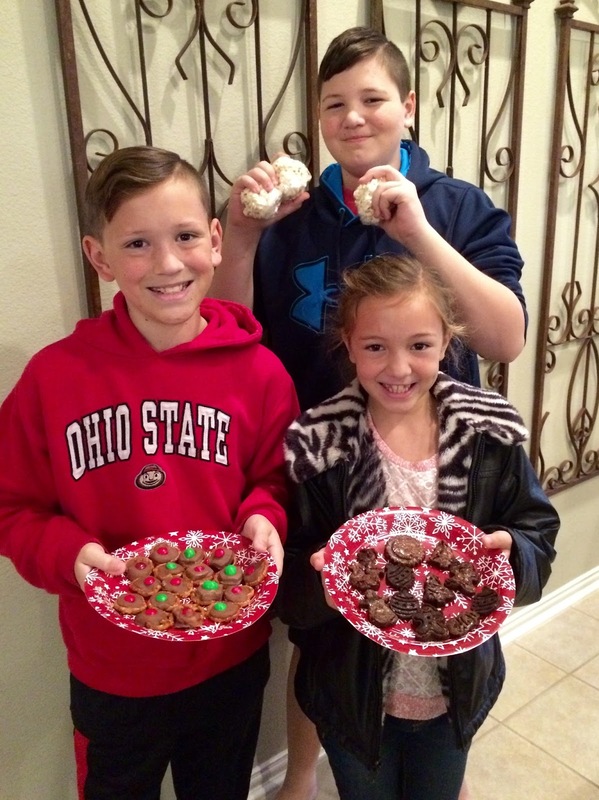 And that's some happy grands...no wonder with the fudgy toffee bars...those look heavenly! I do so love Friendly Village. Thanks for a wonderful post! Sorry I am late...weather and computer problems...Thanks so much for linking to Tuesday Cuppa Tea! Kitty you and I share a fondness for The Friendly Village. How wonderful that you made such lovely memories with your darling grands. Thelma, Tazo Joy tea is my favorite. I missed it this year. Looks like you had a great Christmas. Loved your post. Sylvia D.
What a Christmas you had with all those precious Grands. Your Avatar is absolutely adorable! Your Fudgy Chocolate Chip Toffee Bars were sure a very special treat for your Grands! Thanks so much for sharing this awesome post with us at Full Plate Thursday. Have a great week stay warm and hope to see you again real soon! Oh my these look amazing. I love toffee and chocolate together. Yummy! Thank you for sharing at Dishing it and Digging it link party. We love having you.